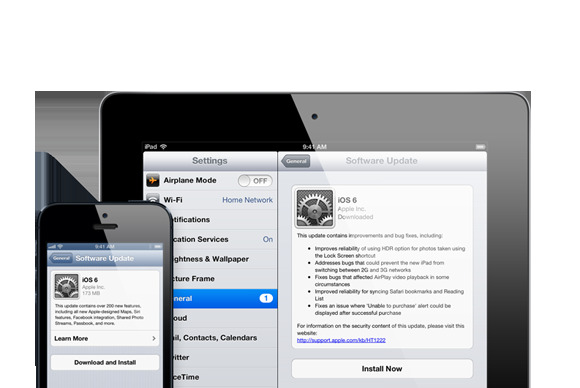 Minor reorganization As often happens with major updates to iOS, Apple has reordered a number of top-level settings items. For example, Twitter has been into a new group with the new Facebook item, and Notes has moved lower in the Settings screen. The Settings app now makes a few frequently accessed options easier to get to. New top-level items In a welcome change for many users, Bluetooth is now a top-level item in the Setting screen, grouped with Airplane Mode and Wi-Fi, for easier access. In addition, while you’ll still need to use this Bluetooth item to pair headsets, speakers, and similar accessories, apps that use particular Bluetooth devices—for example, fitness apps that connect to a Bluetooth 4.0 heart-rate monitor—can now let you pair with those devices directly from within the app, without requiring a visit to the Settings app. Reminders is also now a top-level item, providing the same options (which items to sync, and choosing a default list) as it did within the Mail, Contacts, Calendars screen in iOS 5. 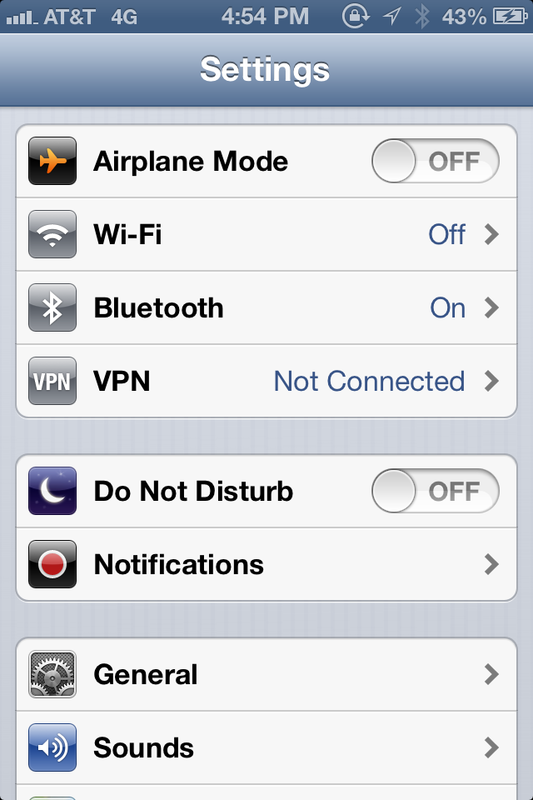 Though you can manually enable Do Not Disturb mode here, a number of useful options are found in a new Do Not Disturb screen accessed within Notifications. Here you can choose specific contacts (or groups of contacts) whose calls won’t be silenced, and you can enable the Repeated Calls option, which bypasses Do Not Disturb mode if the same person calls twice within three minutes. 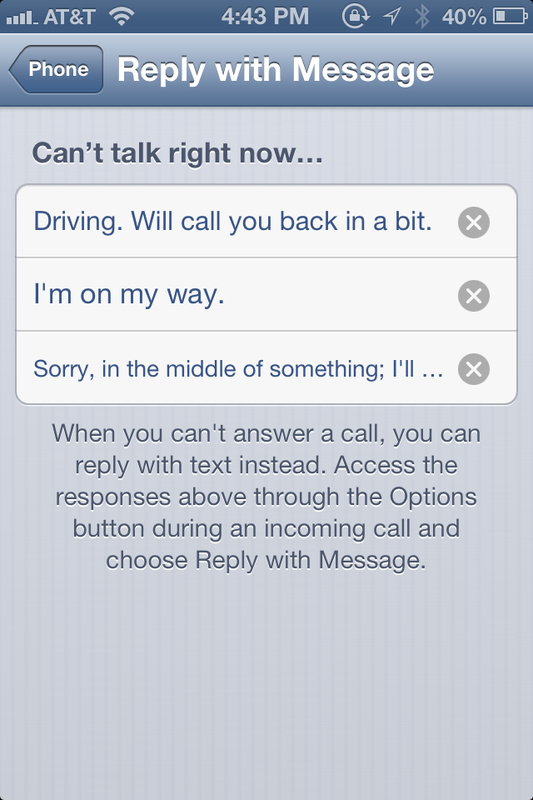 The Repeated Calls option is useful if, or example, someone is trying to reach you because of an emergency. 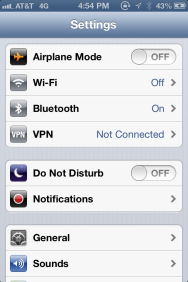 Finally, you can schedule Do Not Disturb to turn on and off at specific times, such as on at 11:00pm and off at 7:30am. Some users also get new settings in the Notifications screen—at the bottom, grouped under Government Alerts—for enabling or disabling AMBER Alerts and Emergency Alerts. In our testing in the San Francisco Bay Area, Sprint and Verizon users see these settings, while AT&T users do not. However, the availability of these settings also appear to depend on your location: Responses to an informal poll of Twitter users indicate that Verizon users in some parts of the country get the settings, but those in other locations do not. 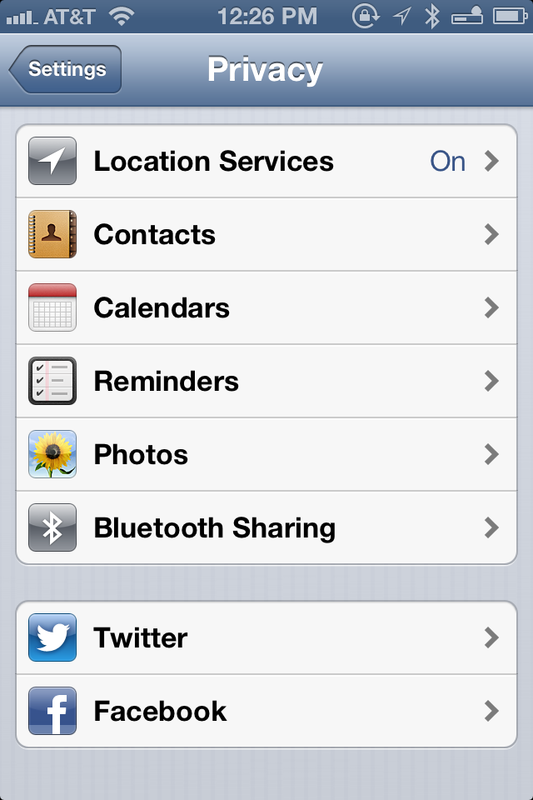 Privacy Location Services has been moved inside a new Privacy screen that lets you fine-tune access to Contacts, Calendars, Reminders, Photos, Bluetooth Sharing, and your Twitter and Facebook accounts. For each type of data, you can choose which apps have access to that data. The Location Services section of Privacy also gains a couple new settings, found in its System Services screen: toggles for Genius For Apps and Wi-Fi Networking. You allow apps to access your personal data in the new Privacy screen. On the iPad, the Sounds item is now at the top level of the Settings app—it was previously buried in the General screen. General Apple has introduced a slew of changes in the General screen. For starters, it no longer contains the Bluetooth option (which, as noted above, has been moved to its own item in the main Settings list). On the iPad, iOS 6 removes the Network item and moves the VPN section up one level—the other items under Network in iOS 5 (Wi-Fi and Personal Hotspot) have their own top-level entries. On the iPhone, the Network item has been renamed Cellular, and new here is a group of settings that let you choose which features (iCloud Documents, iTunes, FaceTime, Passbook Updates, and Reading List) can use cellular data. Note that to allow FaceTime to use cellular data, you must have an eligible cellular plan—AT&T, for example, requires that you subscribe to one of the company’s Mobile Share plans in order to use this feature. On iPads, the Usage screen now includes information on usage and standby time since the last full charge (options that were previously available only on the iPhone). The Auto-Lock screen has gained a Never setting on all devices, and a 15-minute setting on the iPad. 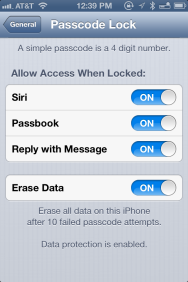 On the iPhone, the Require Passcode option in the Passcode Lock screen has gained settings for 15 minutes, 1 hour, and 4 hours. (Interestingly on an iPad 2, this screen actually loses a few options.) 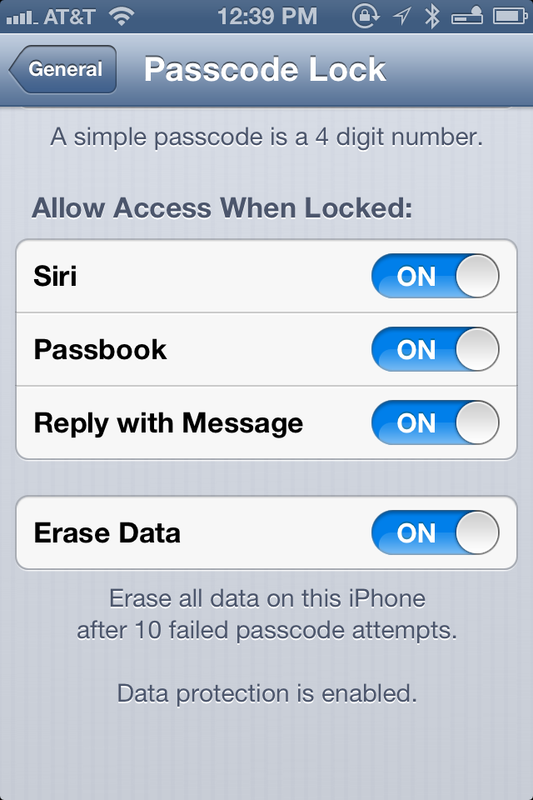 On iPhones, there are also new options to allow Passbook access when the device is locked, and to allow you to use iOS 6’s new Reply With Message feature (see Phone, below) when the phone is locked. The Passcode Lock screen lets you allow Passbook access and reply to incoming calls with messages when the screen is locked. Changes in the International screen include a slew of additional languages for Siri, including several dialects of Chinese, Canadian English, Italian, Korean, and Spanish (Mexico, U.S., and Spain). There are also a couple additional keyboard options, including Canadian and Australian English, and a few new region formats. 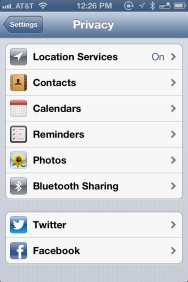 The Shortcuts capability added in iOS 5 has been revamped in iOS 6; it now has its own sub-menu, with a more user-friendly catalog of entries that resembles the Contacts list, and it’s now searchable. The Guided Access feature lets you lock down the iPhone, restricting it to the current app—and even preventing access to some of that app’s features. The biggest new feature in the Accessibility screen is Guided Access mode. 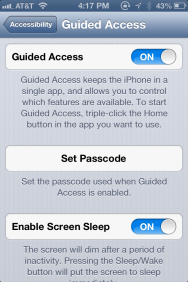 When enabled, Guided Access keeps the iOS device in the current app and lets you control which features are available. To activate Guided Access for an app, you just triple-press the Home button; this enters a setup mode where you draw circles around each area on the screen you don’t want to be accessible—for example, a Settings button. Tap Options to disable touch or the device’s accelerometer (hardware buttons are always disabled when Guided Access is activated). Click Start and the app is protected. 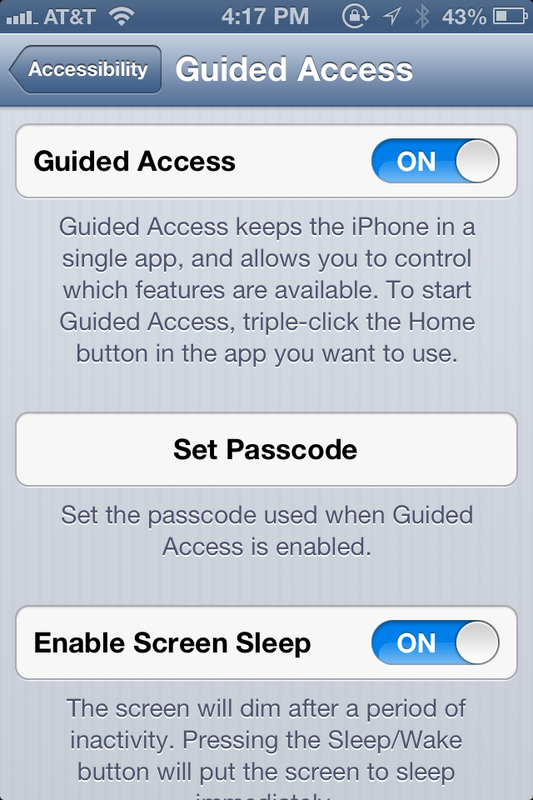 To exit Guided Access, you again triple-press the Home button and then enter your Guided Access passcode. Though intended to help those with accessibility difficulties, this feature is also useful for parents looking to limit their iOS device to a single app and to restrict access to particular features. New in the Accessibility screen on iPhones is a Hearing Aids option that lets you connect to a compatible hearing aid; a new Hearing Aid mode improves audio quality when used with a hearing aid. 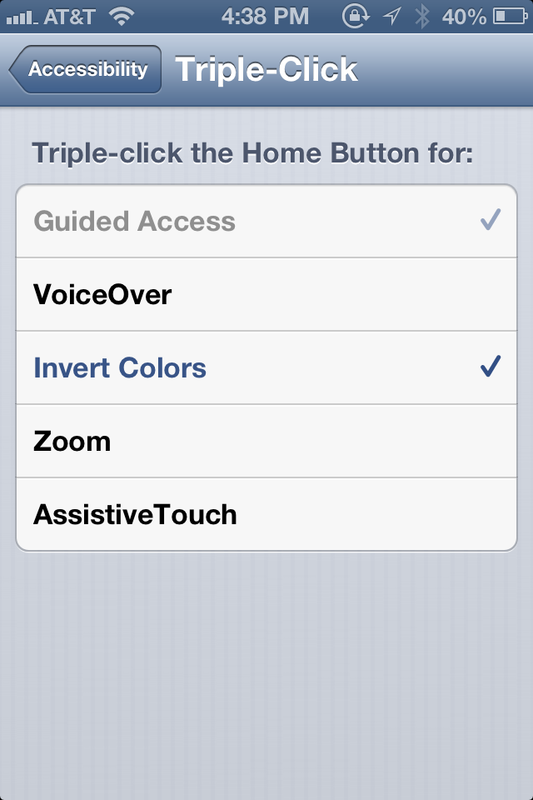 On all devices, there’s also an additional Rotor option (under VoiceOver) for Punctuation, and the White On Black setting is now more accurately called Invert Colors. In a small, but welcome, addition, the slider that controls the volume balance between the left and right channels now has a mark indicating the center. You can now choose multiple options for the triple-press-Home action; when you perform the action, a menu will appear to let you choose the desired option. Under the Physical & Motor section in Accessibility, there’s a new setting that lets you choose how quickly you need to double-press or triple-press the Home button for it to register as a single action, rather than separate presses: Default, Slow, or Slowest. 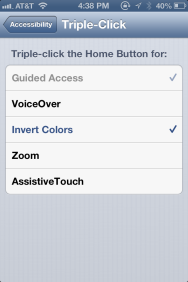 And the Triple-click Home setting now allows you to choose a single action (Guided Access, VoiceOver, Invert Colors, Zoom, or Assistive Touch) to occur, or to choose multiple options that will appear in a menu when you perform a triple-press. Finally, on iPhones, the Custom Vibrations option has been removed; as noted above, you can now create custom vibration patterns in the Sounds screen. Finally, hidden in General > About > Advertising is a new setting called Limit Ad Tracking. If you tap Learn More, at the bottom of this screen, you see Apple’s own explanation of this feature: “iOS 6 introduces the Advertising Identifier, a non-permanent, non-personal, device identifier, that apps will use to give you more control over advertisers’ ability to use tracking methods.” If you enable the Limit Ad Tracking feature, apps cannot use this Ad ID to serve you targeted ads. iCloud On iPhones, the iCloud settings screen now includes an option for syncing your Passbook data, and on all devices, the Photo Stream item now includes a toggle for Shared Photo Streams; if the latter is enabled, you can create photo streams to share with other people and you can subscribe to other people’s shared streams. Mail, Contacts, Calendars The biggest—and most welcome—change in the Mail, Contacts, Calendars screen is found when you tap Signature. Instead of a single text field for a signature that appears in all your messages, you can choose between All Accounts (which gives you that single field) or Per Account. 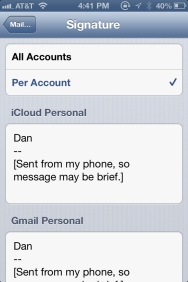 The latter setting offers a separate signature field for each email account you’ve set up on your device. Type or paste your preferred signatures, and Mail will automatically append, to each outgoing email message, the appropriate signature for the sending account. 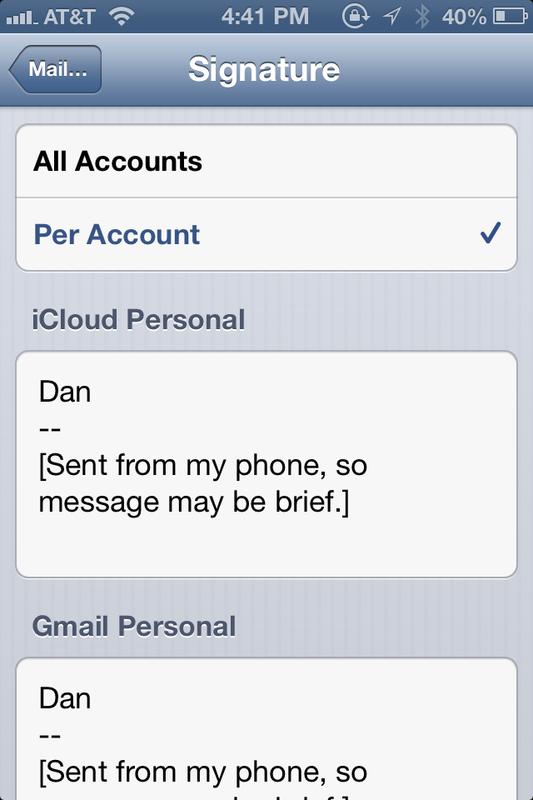 You can now configure a different signature for each email account. Also new here is an option to be notified about changes to shared calendars. On the other hand, the Mail, Contacts, Calendars screen loses the setting for minimum font size in Mail, as well as the section for Reminders settings; the latter has been moved to a new top-level Reminders item. 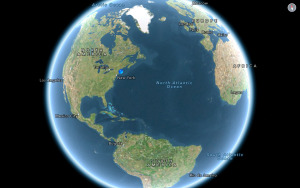 There’s one other minor change in the Phone screen: The setting known in iOS 5 as International Assist, which automatically added the correct country prefix to international calls, is now known as Dial Assist. It performs the same function but can also add the correct local prefix. 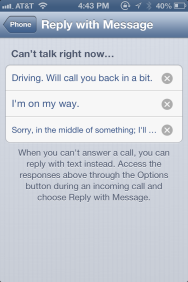 You can configure stock SMS messages and then send them in reply to incoming phone calls. Messages The main change to the Messages screen is that on the iPhone, the iOS 5 setting labeled Caller ID is now called Start New Conversations From, which better reflects what the setting actually does. FaceTime On the iPhone, assuming FaceTime restrictions aren’t enabled, a new option in this screen lets you choose whether FaceTime can use cellular data. As mentioned above, to allow FaceTime to use cellular data, you must have an eligible cellular plan—AT&T, for example, requires that you have one of the company’s Mobile Share plan to use FaceTime over a cellular connection. Safari There’s a new Safari option to use cellular data for Reading List syncing, assuming you haven’t restricted this option using the Restrictions feature. In addition, under Advanced you’ll find the option to enable the new Web Inspector, which lets you connect your iOS device to your computer so that you can preview—on your computer—what a website will look like when actually viewed on the iOS device. On your Mac, this feature is accessed under the Develop menu of Safari; you can enable that menu in OS X Safari’s Advanced Preferences.